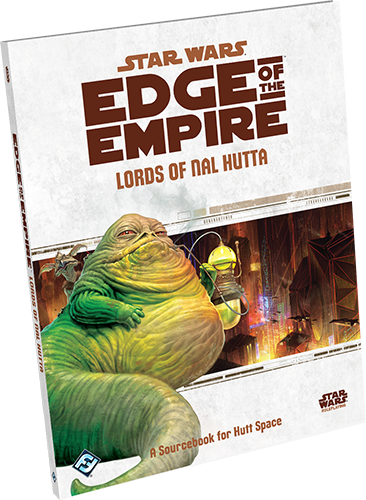 Fantasy Flight Games has announced Lords of Nal Hutta, a new sourcebook for the Star Wars: Edge of The Empire Roleplaying Game that allows you and your friends to escape the oppressive rule of the Empire and engage in devious schemes with the galaxy’s slimiest and most notorious gangsters: the Hutts. In the 144 pages of Lords of Nal Hutta, game masters are given all the information they need to bring the most corrupt and lawless stretch of the galaxy to life. You get information on over a dozen planets, the history, culture, and points on interest in them. Because the Hutts are tied into black markets, the book also provides profiles for a wide range of new weapons, armor, gear, and even exotic weapons. If you’ve got the credits, you can get it all! The book also has five modular encounters that run anywhere from thirty minutes to a full session perfect for game masters to run. The book is scheduled to arrive in the fourth quarter of 2014.